On completion of the west front, Abbot Suger moved on to the reconstruction of the eastern end, leaving the Carolingian nave in use. He wanted a choir (chancel) that would be suffused with light. To achieve his aims, Suger's masons drew on the several new elements which evolved or had been introduced to Romanesque architecture: the pointed arch, the ribbed vault, the ambulatory with radiating chapels, the clustered columns supporting ribs springing in different directions and the flying buttresses which enabled the insertion of large clerestory windows. Gothic architecture is a style that flourished in Europe during the High and Late Middle Ages. 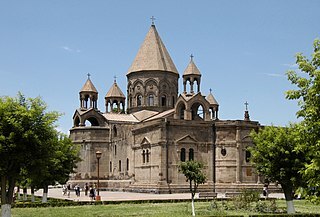 It evolved from Romanesque architecture and was succeeded by Renaissance architecture. 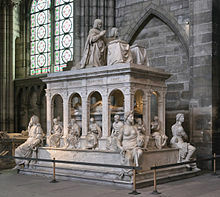 Originating in 12th-century France, it was widely used, especially for cathedrals and churches, until the 16th century. The architecture of cathedrals, basilicas and abbey churches is characterised by the buildings' large scale and follows one of several branching traditions of form, function and style that all ultimately derive from the Early Christian architectural traditions established in the Constantinian period. Suger was a French abbot, statesman, and historian. He was one of the earliest patrons of Gothic architecture, and is widely credited with popularizing the style. Saint Denis was a legendary 3rd-century Christian martyr and saint. According to his hagiographies, he was bishop of Paris in the third century and, together with his companions Rusticus and Eleutherius, was martyred for his faith by decapitation. Some accounts placed this during Domitian's persecution and identified St Denis of Paris with the Areopagite who was converted by St Paul and who served as the first bishop of Athens. Assuming Denis's historicity, it is now considered more likely that he suffered under the persecution of the emperor Decius shortly after AD 250. Denis is the most famous cephalophore in Christian legend, with a popular story claiming that the decapitated bishop picked up his head and walked several miles while preaching a sermon on repentance. He is venerated in the Catholic Church as the patron saint of France and Paris and is accounted one of the Fourteen Holy Helpers. A chapel was raised at the site of his burial by a local Christian woman; it was later expanded into an abbey and basilica, around which grew up the French city of Saint-Denis, now a suburb of Paris. 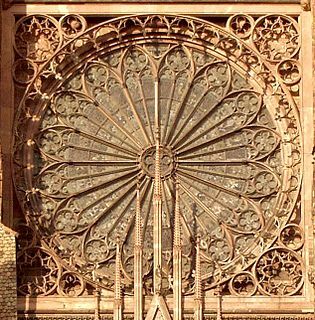 Rose window is often used as a generic term applied to a circular window, but is especially used for those found in churches of the Gothic architectural style that are divided into segments by stone mullions and tracery. 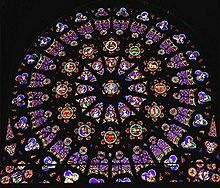 The name "rose window" was not used before the 17th century and according to the Oxford English Dictionary, among other authorities, comes from the English flower name rose. Rouen Cathedral is a Roman Catholic church in Rouen, Normandy, France. It is the see of the Archbishop of Rouen, Primate of Normandy. The cathedral is in the Gothic architectural tradition. Bourges Cathedral is a Roman Catholic church located in Bourges, France. 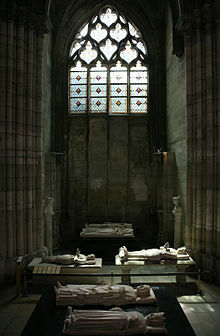 The cathedral is dedicated to Saint Stephen and is the seat of the Archbishop of Bourges. It is in the Gothic and Romanesque architectural styles. Sens Cathedral is a Catholic cathedral in Sens in Burgundy, eastern France. The cathedral, dedicated to Saint Stephen, is the seat of the Archbishop of Sens. Blois Cathedral, or the Cathedral of St. Louis of Blois, is a Late Gothic Roman Catholic cathedral in Blois, France. It has been a monument historique since 1906. The Basilica of Saints Nazarius and Celsus is a Roman Catholic minor basilica located in the citadel of Carcassonne, France. It is a national monument, and is in the Gothic-Romanesque architectural tradition. French architecture ranks high among France's many accomplishments. Indications of the special importance of architecture in France were the founding of the Academy of Architecture in 1671, the first such institution anywhere in Europe, and the establishment in 1720 of the Prix de Rome in architecture, a competition of national interest, funded by the state, and an honor intensely pursued. If the first period of France's preeminent achievement was the Gothic, and the second, the eighteenth century, the longer tradition of French architecture has always been an esteemed one. French Gothic architecture is a style which emerged in France in 1140, and was dominant until the mid-16th century. 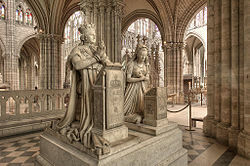 The most notable examples are the great Gothic cathedrals of France, including Notre Dame Cathedral, Chartres Cathedral, and Amiens Cathedral. 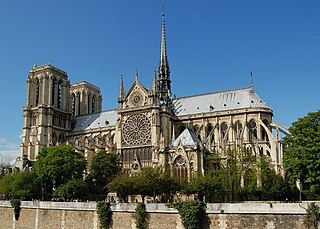 Its main characteristics were the search for verticality, or height, and the innovative use of flying buttresses and other architectural innovations to distribute the weight of the stone structures to supports on the outside, allowing unprecedented height and volume, The new techniques also permitted the addition of larger windows, including enormous stained glass windows, which filled the cathedrals with light. The French style was widely copied in other parts of northern Europe, particularly Germany and England. It was gradually supplanted as the dominant French style in the mid-16th century by French Renaissance architecture. Romanesque art is the architecture of Europe which emerged in the late 10th century and evolved into the Gothic style during the 12th century. The Romanesque style in England is more traditionally referred to as Norman architecture. Maillezais Cathedral is a ruined Roman Catholic church in the commune of Maillezais in the Vendée, France. Formerly the site of the Abbey of Saint-Pierre, the site grew from the 10th century abbey to the cathedral completed in the 15th century, with the many structures at the site abandoned by the end of the 17th century. Today's ruins consist of a cathedral, refectory, dormitory, kitchen, cellars, turrets and ramparts. The cathedral has been declared a heritage monument in reflection of its Romanesque, Gothic and Renaissance architectural form. It was designated a monument historique on 30 January 1924. The cathedral belonged to the Diocese of Luçon, with Roman Rites, and with St. Peter as the patron saint. Saint-Germer-de-Fly Abbey is a former Benedictine abbey located in the village of Saint-Germer-de-Fly, in Picardy in the Oise département of France. Only the late Romanesque-early Gothic church remains, now the village parish church. It is regarded as one of the earliest manifestations of the Gothic style in France. A Gothic chapel added in the mid-13th century is noted as a smaller-scale reinterpretation of the Sainte-Chapelle of Paris. 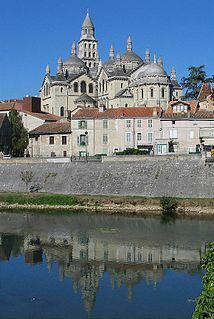 The Basilica of Saint-Quentin, formerly the Collegiate Church of Saint-Quentin is a Catholic church in the town of Saint-Quentin, Aisne, France. There have been religious buildings on the site since the 4th century AD, which were repeatedly destroyed and rebuilt during the Early Middle Ages. The present basilica was constructed in stages between the 12th and 15th centuries. It was severely damaged in World War I (1914–18), and was only reopened in 1956 after extensive reconstruction. 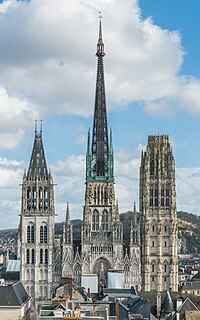 The Basilique Notre-Dame de Bonsecours is a Gothic Revival basilica in Bonsecours near Rouen, Seine-Maritime, France. It is the first church in France to be built in the Gothic Revival style. The church is richly decorated, with the windows, sculptures and other elements often carrying the name or coat of arms of a donor. Romanesque architecture appeared in France at the end of the 10th century, with the development of feudal society and the rise and spread of monastic orders, particularly the Dominicans, which built many important abbeys and monasteries in the style. 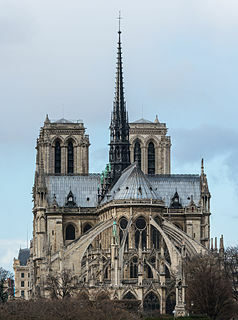 It continued to dominate religious architecture until the appearance of French Gothic architecture in the Ile-de-France between about 1140-1150.